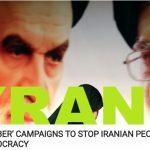 On Saturday, July 28th, The Daily Caller published an article entitled “Iran Echo Chamber’ Campaigns to Stop Iranian People’s Struggle Against the Theocracy’, revealing Iranian regime’s apologists and their campaign against a firm position towards the dictatorship ruling Iran also questioning Rouhani’s label as a “moderate”. The article drew comparisons between Rouhani and other hard-liners within his organization, suggesting Rouhani and regime’s Foreign Minister Zarif are wolves in sheep’s clothing and painting the picture of them as reformers or moderates creates a dangerous and misleading narrative. The article argues that Rouhani is a destabilizing factor on the global stage. His latest blustering included a threat of war with the US should they prevent Iran’s oil exports. At a meeting with foreign ambassadors in Tehran, Rouhani stated, “anyone who understands politics a little bit would never say that he/she would prevent exports of Iran’s oil,” adding, “America should know the war with Iran is the mother of all wars”. Rouhani suggested that if Iranian oil exports were interrupted, Iran would close the Strait of Hormuz, a strategically important body of water linking the Persian Gulf with the Oman Sea. The strait is a trade artery for the whole Middle East and its closure would inflame geopolitical tensions across the region. With such dangerous and grave consequences, the decision to threaten the international community is this way are not the actions of a moderate reformer. Rouhani’s threats were welcomed by the hard-line leaders of both the Islamic Revolutionary Guard Corps (IRGC) and the Quds Force. Major General Mohammad Ali Jafari, the IRGC commander, expressed his support, stating, “we stand ready to put in action President Hassan Rouhani’s latest position that if Tehran were not able to export its crude oil through the Strait of Hormuz, no other country would be able to do so”. The IRGC terrorist Quds Force commander, Qassem Soleimani echoed Jafari’s sentiments. While Rouhani’s posturing is designed to provoke, we cannot dismiss his words as empty threats. The Daily Caller article points out that Tehran is internationally isolated, and the mullahs are losing their grip on power at home as the country’s economic and social crisis worsens. The President has already sent a signal to the international community. Rouhani, along with senior members of his regime, planned a terror attack against the Iranian opposition in Paris. The National Council of Resistance of Iran (NCRI) and the People’s Mujahedin Organisation of Iran (MEK) organized their annual Free Iran Rally in Paris on June 30th. A Belgian couple was detained by French authorities armed with explosives and instructions to attack the rally. They had received their explosives from an Iranian diplomat working at the Iranian embassy in Austria. The article argues that Rouhani’s aggressive threats and foiled plot to launch a devastating terrorist attack on European soil demonstrate that he is far from the moderate reformer he is often touted to be. Mike Pompeo, the US Secretary of State, suggested the same thing. During a speech to the Iranian-American community living in the United States, he cast doubt on Rouhani and Zarif’s moderate image. “The truth is they are merely polished front men for the ayatollahs’ international con artistry. Their nuclear deal didn’t make them moderates; it made them wolves in sheep’s clothing”, he said. 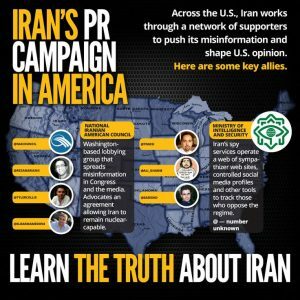 An infographic distributed widely on the internet to express outrage against biased and propaganda pieces against MEK by regime apologists. The regime has allies in the Western media, like Guardian journalist Saeed Kamali Dehghan and MSNBC producer Darius Bazargan, who perpetuate the myth of Rouhani as a moderate reformer. Former Iranian Intelligence Minister Ali Fallahian even admitted that the regime had sent agents to infiltrate foreign media outlets and promote regime interests in the Western media. This was apparent following the foiled terror attack in Paris. Several media outlets published pieces criticising the victim, the NCRI and MEK and their leader, President-elect Maryam Rajavi. They attacked both the Iranian opposition directly, and President Trump for the firm stance he is pursuing towards the Iranian regime. The article cites the attacks on US ambassador Nikki Haley as an example of pro-regime journalists targeting MEK and NCRI sympathizers. Haley retweeted a photo from the official MEK Twitter account. Journalists working for BBC Persian singled the ambassador out in their criticisms. The BBC Farsi channel is known as “Ayatollah BBC” in Iran for its pro-regime positions. These journalist’s criticism and vilification of the Iranian opposition movement and the MEK attempt to offer justification for the mullahs’ attempted terror attack. They create an atmosphere of appeasement to the regime and of hostility towards the NCRI and MEK. This, Daily Caller article argues, sows “discord among Iranian communities” and is yet another strategy from the regime to fragment and divide the opposition. By creating a competing narrative and fostering a debate over Rouhani as a hard-liner or a moderate, the regime can effectively weaken the opposition by preventing the formation of a united front.